We arrived at St Lucia train station at 10 am in the morning. As soon as we arrived, we directly went to our apartment that we booked via Airbnb. Since we already made arrangement with the host to meet at the Tolentini church, we crossed Ponte degli Scalzi to go to Santa Croce area (this bridge is on the left once you exit the station overlooking the Grand Canal). After getting settled in the apartment, we began our exploration of the city starting by visiting Rialto Market and the Bridge. As I said in my previous entry before, Venice street is like a giant maze. There is NO free tourist map available but you can pay for €2 in a shop near the train station. I had a free Venice guide app with map on my iPhone that helped us a LOT! Actually, there were lots of sign pointing to Rialto and San Marco – the two most famous attractions in Venice – that you can follow. Ah… Venetian canal 🙂 Love it! Another alternative is using Vaporetto (water bus). The ticket is sold by hour and days, i.e. 12/24/36/48 hours or 7days. You can also buy Grand Canal tour in this ticket booth. The vaporetto has 24-hours service so you can roam the city at midnight or even dawn. The challenge with taking vaporetto is that the route maps are so confusing with so many lines in one picture. I pictured it like a metro or subway line in my mind. However, some of the stations have 2 or more docks and sometimes they are 100 meters apart! The easiest way is to look for the board explaining the dock area (usually called as A,B,C) and then match it with the corresponding boat number and its destination. There is also a monitor showing the departure time for each boat number at each dock along with the final destination. This monitor also shows the name of the stations where the boat will stop until it reaches the final destination. Sound confusing, eh?! See how confusing this map is ?_? Dock A, B, C, D, E, F looked close enough in the map, the fact is NOT that close! Using our GPS on the iPhone, we walked to Rialto Market. The shops around this area were pretty unique. There are traditional Italian pastry, Venetian mask shops, Italian leather shops, and – of course – souvenirs shops. We then walked toward the famous Rialto Bridge and took pictures from above the bridge and the dock at the side of the bridge near the Grand Canal. A lot of tourists were taking picture too, so be patient if you want to have a picturesque snap. 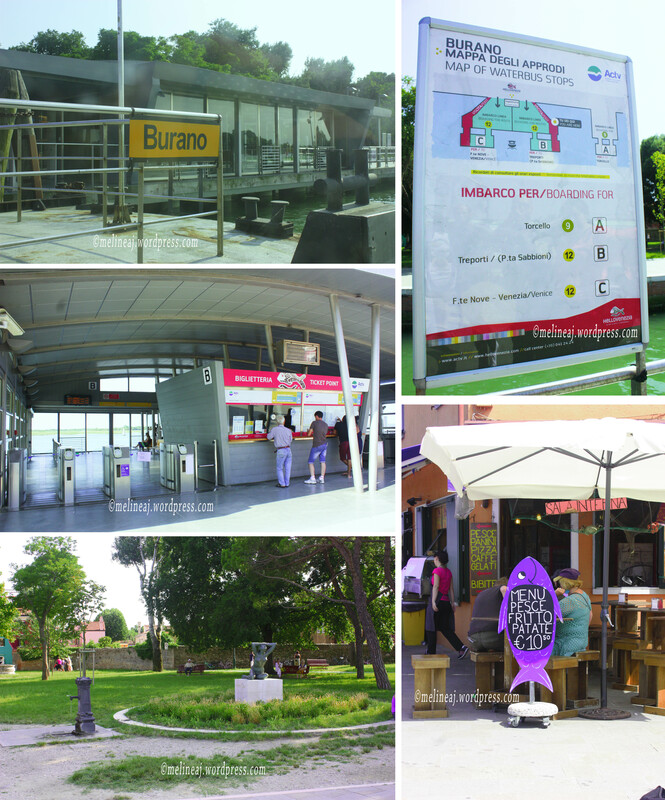 Tired from walking the crowded street, we decided to buy 36 hours vaporetto ticket to go to Burano Island. I must say, taking vaporetto was a good decision for my legs. 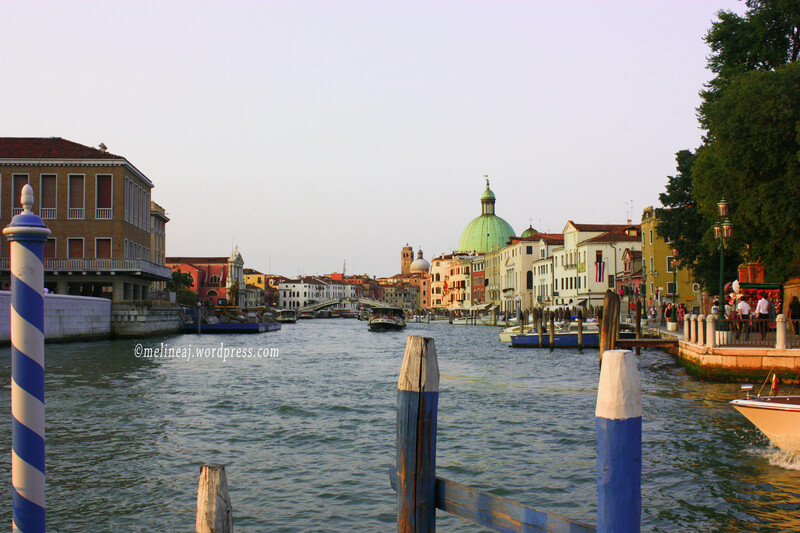 It also gave us a chance to see beautiful Venetian architecture along the canal. From Rialto, we took #2 boat to San Marco station. 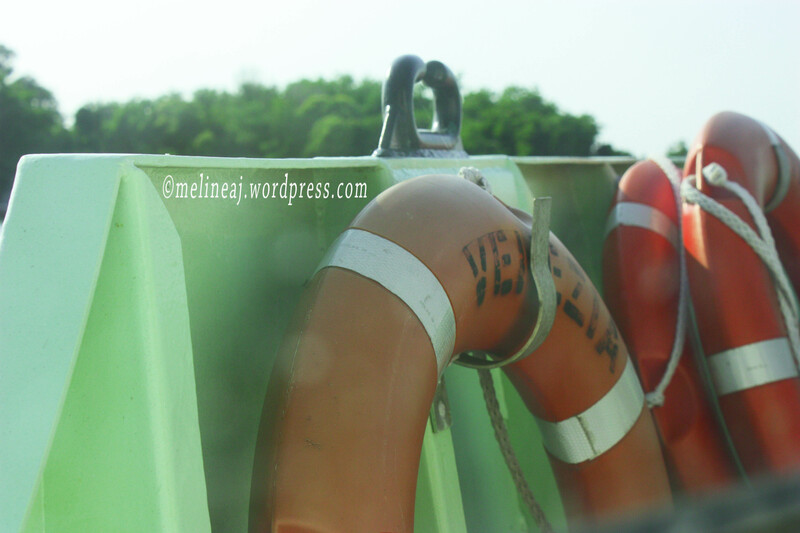 The boat driver said that we have to change to another boat here but we didn’t see the corresponding number. 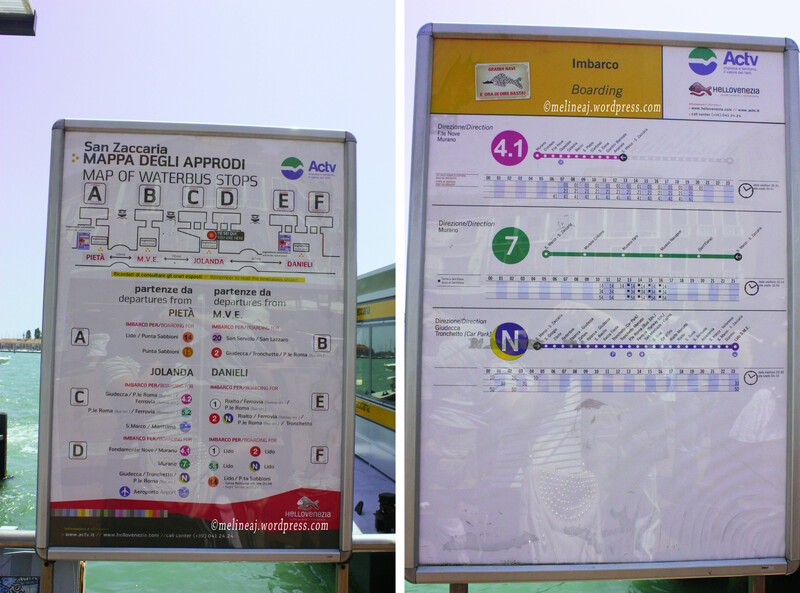 With little sign and information, this was why riding vaporetto was a challenge for us. We asked around and the lady in the ticket booth that we had to walk couple meters away to the east, cross 2 bridges, and pass Piazza San Marco. Finally, we found the dock to take #7 boat (Pt. Sambrori). 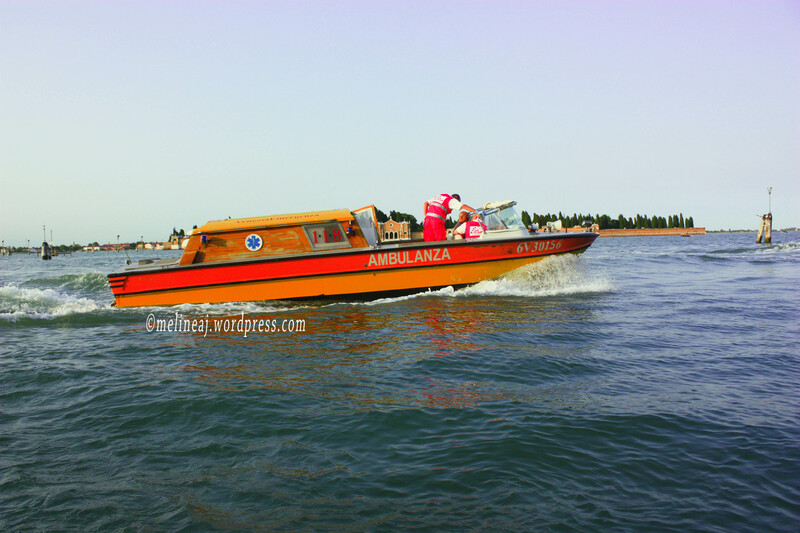 The boat driver said we had to transfer at Murano Fero, so we stopped there and take #12 boat to Burano. The total one-way trip took about 45 minutes to an hour – depending how long do you have to wait to get to the next boat. The boat has small covered seating area and outside area for standing. When you are outside, don’t forget to enjoy the view of beautiful emerald water splashing on the side of the boat. When we stopped at Murano Fero, the next #12 boat wouldn’t come until 30 minutes later, so we strolled around the island to see the famous Venetian glass blowing factory. 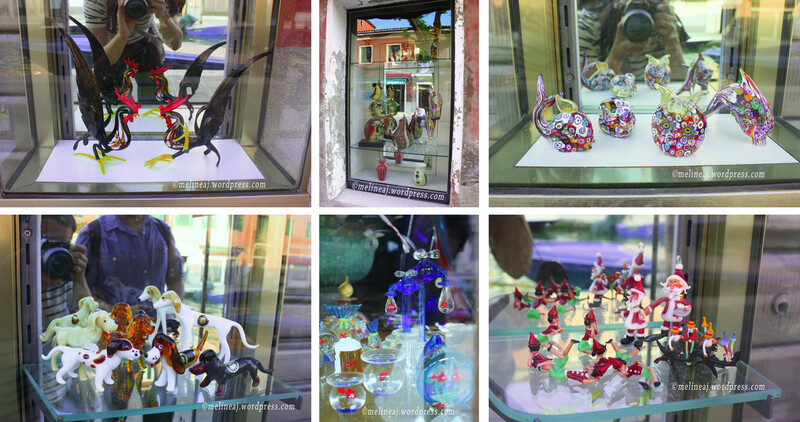 There are many authentic Murano glass shops in this area with different signatures. They sell small decorations, jewelries (pendant, bracelets, earrings), and also big beautiful glass chandeliers – that was super expensive. 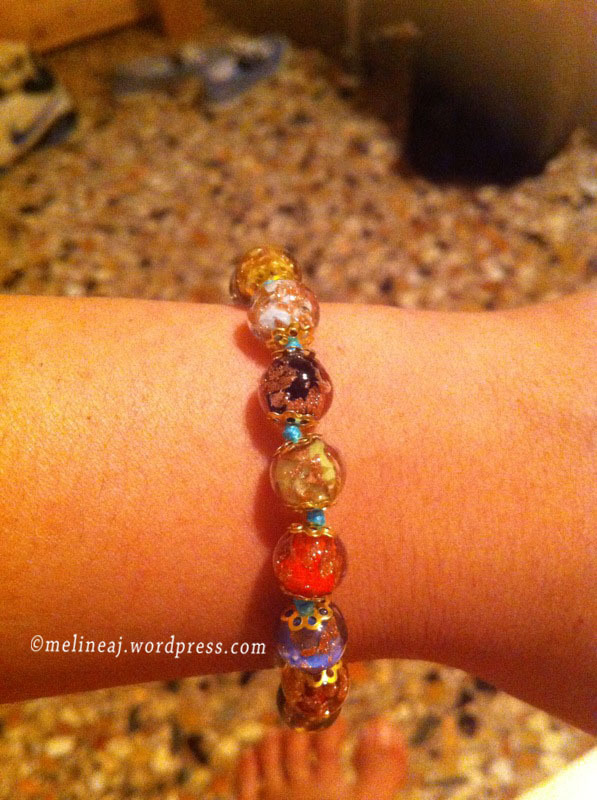 The authentic Murano glass piece usually comes with certificate to guarantee that the piece was made in Italy. I bought two glass bracelets (one for me and one for my mom) for €8 each. The younger shopkeeper said that his dad was the one who made all the jewelries. They even had a small working area where we could see how they make the beautiful jewelries. The trip from Murano Island to Burano Island only took about 15 minutes. 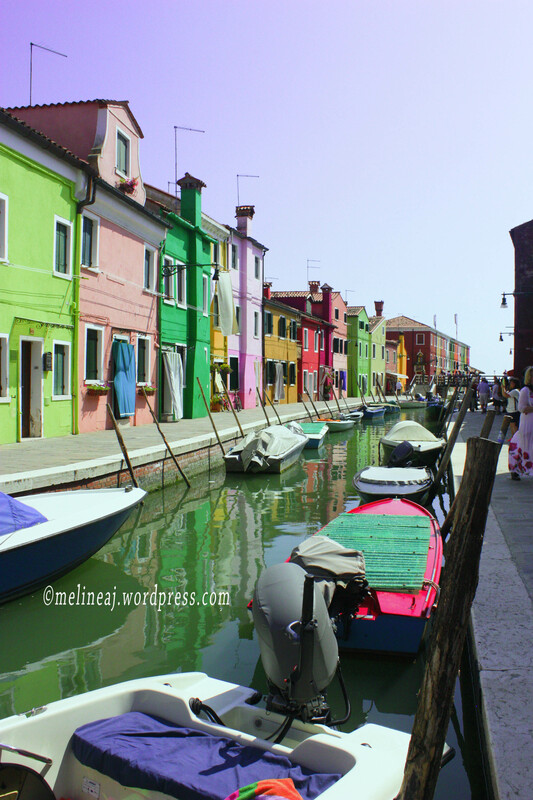 Burano is a small island that is well known for its lace. The handcrafted lace was kinda old fashion but the details were amazing! The original Burano lace might be expensive if you want to buy one. Some of the shops had a workshop inside with a lady making the lace. 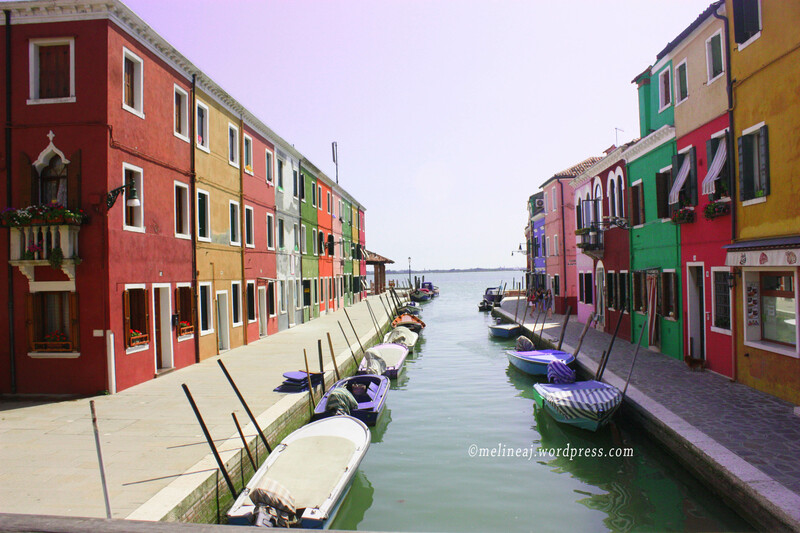 The most noticeable thing once we got off at Burano was the brightly painted house. Burano actually consists of 5 small islands connected by bridges. 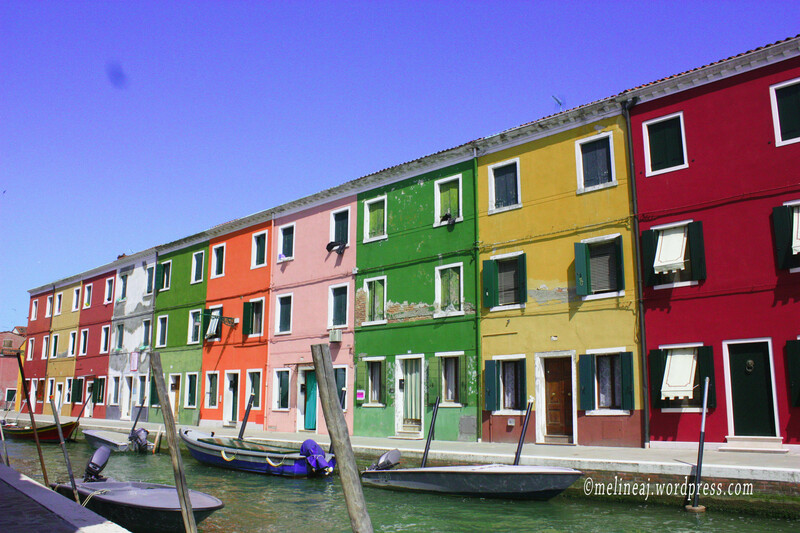 These houses looked like two rainbows strip at the side of the stream flowing through the island. Rumor has it that if one wants to repaint the house, he has to ask the government permission for specific color to be painted on the house. This island can be crowded with tourists. When we got there around 3pm, there were lots of people looking around and taking pictures. By about 5 or 6 pm, the island became quieter with locals doing their daily activities, children playing on the fields, and finally, we could enjoy the sunset view from one of the waterfront. Since we were hungry and we realized that we wouldn’t get back to the main island until an hour later, we decided to find a decent restaurant for an early dinner. We passed Principale Restaurant and saw that they serve squid ink pasta! This was what I’m looking for!!! 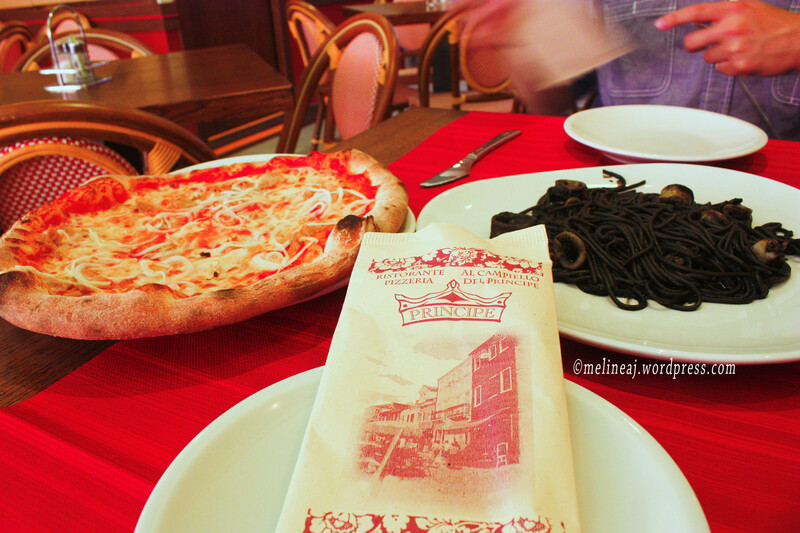 So, we went in and ordered a plate of Spaghetti al nero de seppia and a pizza. The squid ink pasta was gooood! The pizza was huge! And we were stuffed! We spent €31 for the food which includes €2.5 service fee per person. Yes! We just spent €5 by sitting in a restaurant for about 45 minutes! 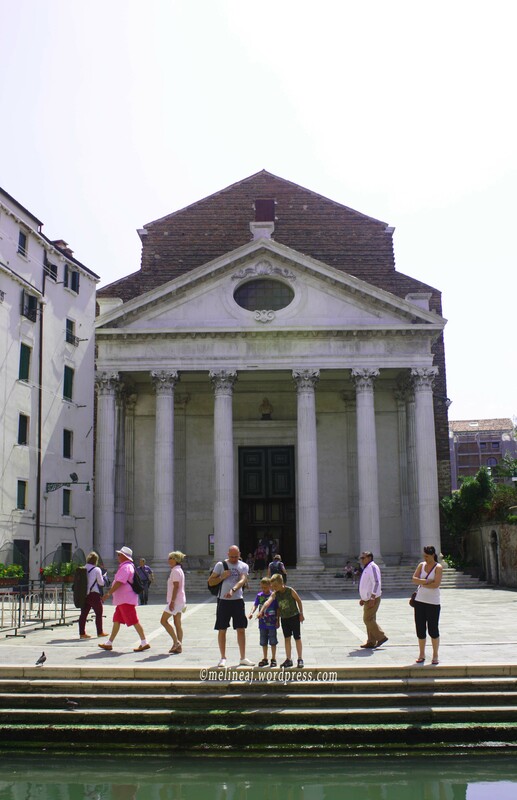 Across Italy, the sitting fee is common practice. As for tourists, few of them are familiar with the ‘extra’ fee charged by the restaurant. We already knew this information from my research, but we didn’t expect the fee to be that high! However, we didn’t regret it too much since the food was good there but for the next restaurant we went, we ALWAYS check whether they charged for sitting fee or not. From Burano, we took #12 boat to Murano Faro and then transferred to #4.2 boat to the main island (we stopped at Pizzale Rome). The #4.2 boat circles Murano Island (it stopped at almost every station in Murano); hence, it took longer to reach the main island. 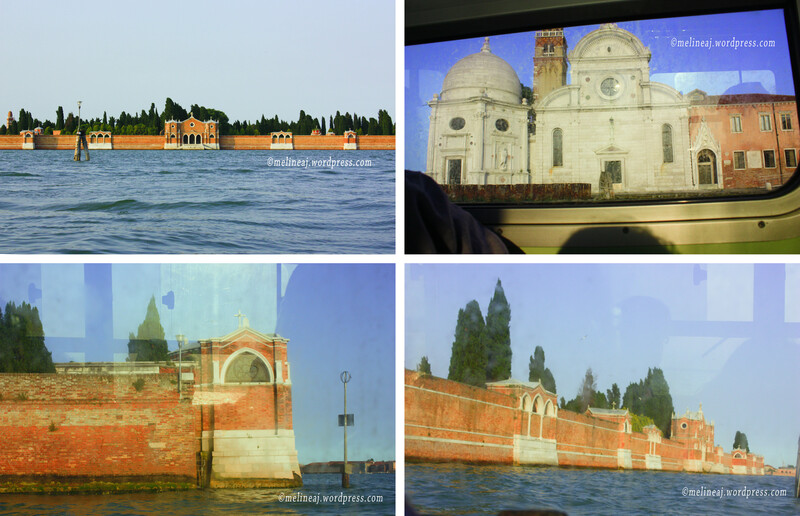 It also passed Isola di San Michele – an island designated as cemetery. The high wall around this island gave you the creepy atmosphere. 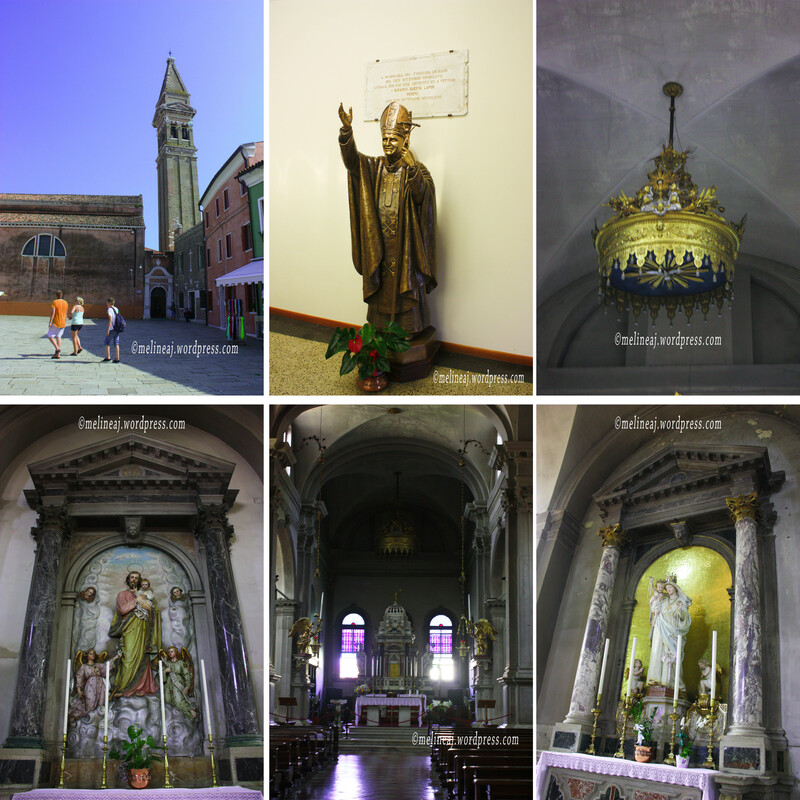 Tourists on tripadvisor give a good review about San Michele, so it might worth your time to check it out. When we walked toward our apartment, we saw a Coop mini-market nearby. This mini-market occupies 3 buildings with small passage at the very back of each buidling. The variety of stuffs that they sell was pretty much a lot. Oh… if you want to buy the cheapest bottle of water, go here!!! It was €0.65 for 2L bottle! (we bought one 2L bottle from a gelato shop for €3!!! What a rip off!!!). Since my husband wasn’t feeling well from the boat ride (I think he got sea sick and a bit of cold), we decided to just rest at the apartment and called it a day. If you see weird colors on my picture from Paris day 4, Venice post, and some of Rome post, it’s because of my camera setting. I use Canon Xsi for taking picture and didn’t realize that I had ‘twilight’ setting for Av mode. Thus, all my pictures tend to have purple tint… Argghhh… and I didn’t know this until we were in Rome :S I tried to edit the picture as best as I could but yeah… my photoshop skill is just less than average. So, yeah…I missed the bluest sky over the Venice. Or maybe it’s a sign that we should go back to Venice to take a better picture?! hahaha… Ah… I wish!